The LEAD Mongolia fellows pose for a group shot at the Virginia School for the Deaf and the Blind. Democracy is best understood when you see it in action. Last fall, the Leaders Advancing Democracy (LEAD) Mongolia Program brought a group of up-and-coming democracy advocates to the United States for a three-week exchange program in which they explored the country’s democratic values and discovered how they can work together to address critical issues such as poverty and unemployment, the environment and urbanization, and transparency and anti-corruption. 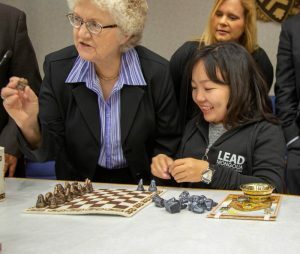 LEAD Mongolia, which is funded by the U.S. Agency for International Development (USAID) and implemented by World Learning, aims to support Mongolia’s young democracy by providing its next generation of champions with opportunities to make a difference. LEAD fellows design civic action projects in their communities, encourage civic engagement among high school students, and share their insight into the workings of democracy with other leaders in Bhutan, Kyrgyzstan, and Myanmar. 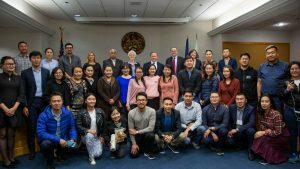 The U.S. exchange is one important component of the LEAD Mongolia program, offering fellows firsthand experience with U.S. democracy. During their three weeks in the country, fellows take part in lectures and workshops, explore U.S. culture, and begin work on their civic action projects. A portion of the program is hosted by the University of Virginia Center for Politics in Charlottesville, Virginia. LEAD Mongolia fellows Enkhbayar Batsukh (left), a local government employee who specializes in private sector development and Nyamdemberel Dorj (right), a civil society activist. 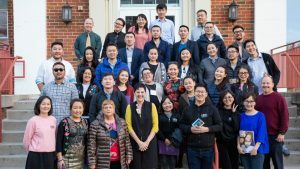 World Learning accompanied this year’s group in Charlottesville to find out what a day in the life of a LEAD Mongolia exchange is like. Two of the fellows — Enkhbayar Batsukh, a local government employee who specializes in private sector development, and Nyamdemberel Dorj, a civil society activist — checked in with us throughout the day to share their thoughts on everything from teambuilding to making education and employment accessible to people with disabilities. A LEAD Mongolia fellow navigates the ropes course at the Poplar Ridge Challenge Course. LEAD Mongolia participants started the day with teamwork. 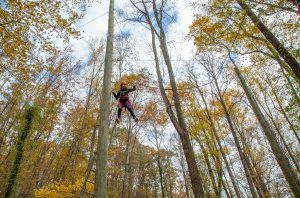 At the Poplar Ridge Challenge Course, they helped one another cross a shaky high wire by using ropes to hold it taut and shouting encouragement. In another exercise, they worked together to balance nearly a dozen people on a small wooden plank without tipping over. Ultimately, the fellows learned how to solve problems through trust, communication, and leadership. 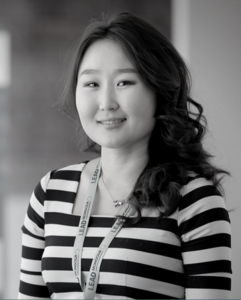 These skills will be essential for when they return to Mongolia to work on projects together addressing some of the country’s most pressing issues. LEAD Mongolia fellows visit Vector Industries to learn about how they help create employment opportunities for people with disabilities. 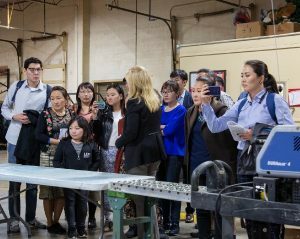 After lunch, the LEAD fellows drove about 30 miles west to Waynesboro, Virginia, where they learned how Vector Industries has created employment opportunities for people with disabilities. Vector Industries is a nonprofit that works with manufacturers across the region to provide assembly, packaging, fulfillment, and other logistical support. It employs people with disabilities, even providing them with transportation to get to and from work. The Virginia School for the Deaf and Blind. Next, the LEAD fellows headed further west to the city of Staunton, where they discovered how the state provides public education to students with disabilities at the Virginia School for the Deaf and Blind. During a tour of the campus, LEAD fellows learned about how the school is technically also a state agency. It provides comprehensive services and support to students with disabilities, offering transportation to young people across the state, employing staff and faculty members with disabilities, creating equal bilingual classrooms using both American Sign Language and English, and offering worksite experience programs. 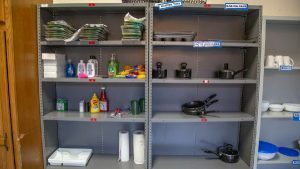 Students can shop for household goods as part of the school’s independent living program. LEAD fellows were particularly amazed by the school’s independent living program, in which students live in on-campus apartments for nine-week periods to help them learn how to pay their bills, shop for groceries, prepare meals, and more. 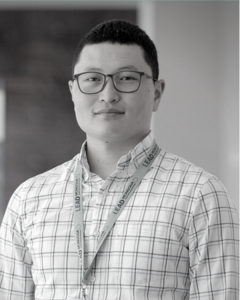 “When we think of training disabled people, we always think of how to help them read and write but never how they will live independently,” Batsukh said. The LEAD Mongolia fellows pose for a group shot at the Staunton City Council Meeting. LEAD fellows ended the day by attending a Staunton City Council meeting to witness U.S. local government and citizen engagement in action. Mayor Carolyn W. Dull led the meeting, which included discussion of public ordinances and the council’s vision for 2035 as well as opportunities for citizens to weigh in on various issues such as the petition to change the name of a local high school. Two of the LEAD participants spoke as well, thanking the council members and American citizens alike for allowing them to attend the meeting. LEAD Mongolia fellow Dorjgotov Ganbold presenting a gift to the mayor of Staunton. 9 p.m. Head back to Charlottesville! 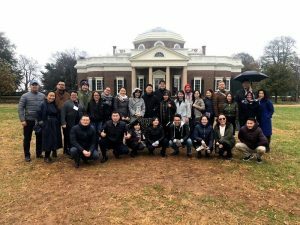 The LEAD Mongolia fellows on the University of Virginia campus.